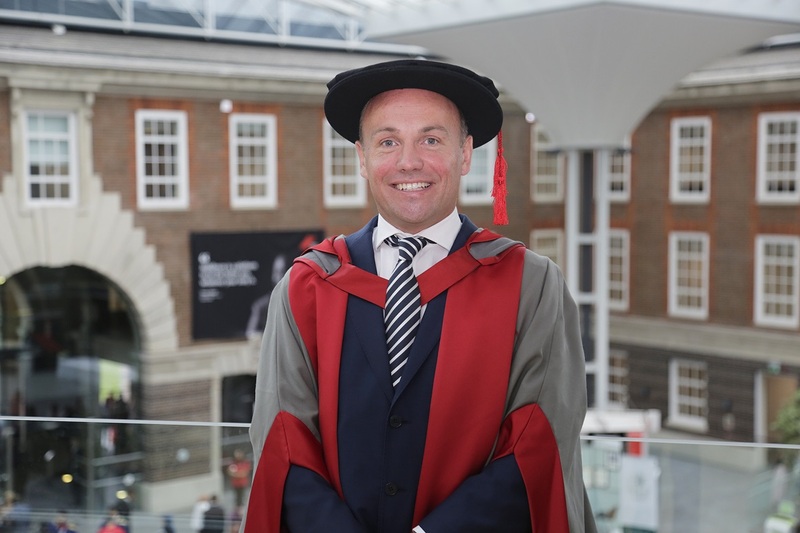 Middlesex University London alumni David Buttress - who went on to found fast-food giant JUST EAT - has returned to the University to receive an honorary degree. David led JUST EAT from startup to becoming Europe’s largest technology stock market flotation in a decade when it listed on the London Stock Exchange in April 2014, before stepping down as CEO in March this year. Returning to Middlesex has brought up fond memories for David. “I am delighted to accept this honorary degree," he says. "I spent three happy years at Middlesex University and my undergraduate degree paved the way for me to start JUST EAT here in the UK. It was an important part of my path as an entrepreneur. David holds a BA in Law and Business from Middlesex University Business School. He began his career with Coca-Cola Enterprises in 1998 where he enjoyed a variety of senior sales roles. In 2014, he was named Entrepreneur of the Year at the Investor Allstars Awards and was listed as one of the London Evening Standard’s top 1,000 influential people in the same year. He was also named as one of Britain’s most influential people in the Debrett’s 500 2015, 2016 and 2017. David is now a Partner at 83 North, a global venture capital firm. Professor Tim Blackman, Vice-Chancellor of Middlesex University, was proud to welcome David back to Middlesex. “By awarding an Honorary Degree to outstanding people such as David Buttress the University is recognising achievement at the highest level as well as dedication to public duty and making a difference to others’ lives. “I am delighted to be part of today’s ceremony and to congratulate each of our honorary graduates on their incredible achievements. Follow Graduation 2017 at Middlesex on Facebook, Instagram and Twitter. You can find us on Snapchat too.